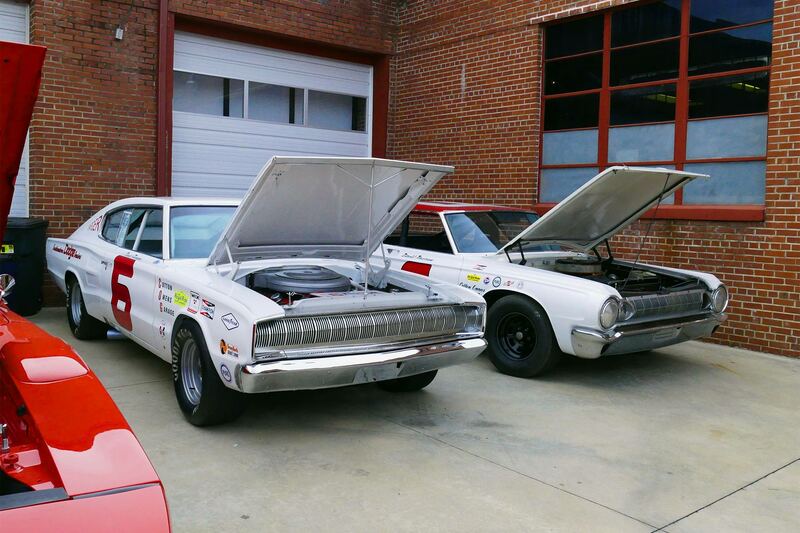 Below are photos of a very faithful reproduction of the original 1966 Cotton Owens Garage Charger driven by David Pearson to the 1966 NASCAR Grand National Championship. Special thanks to Craig G. for the pictures and information. 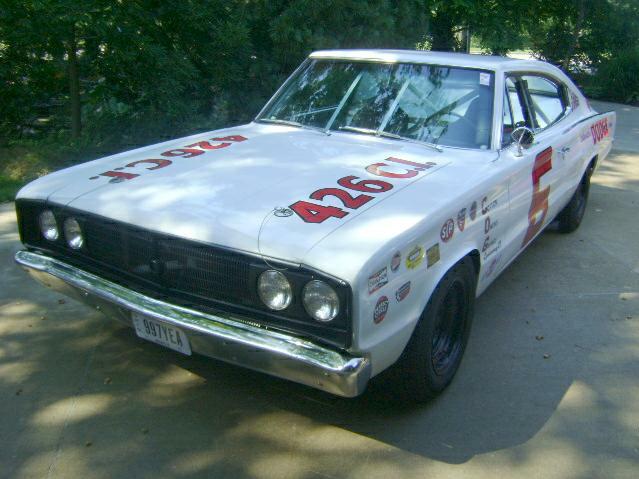 Actual Nascar 426 Hemi Engine, obtained from Richard Petty. Engine has all of the time period correct Nascar parts. Magnesium oil pan with internal chain drive dry sump pick-up pump in the pan. Larger Nascar Oil Pump with fittings for lines to dry sump tank. 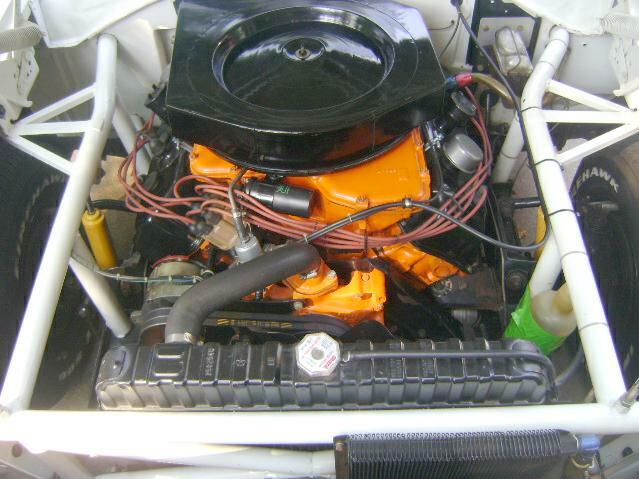 Correct Nascar “Bathtub” Intake with Holley LeMans center feed float bowls carburetor. Correct “Elephant Ears” Hemi engine front mounting bracket to frame. Correct Motorola double pulley alternator with double groove water pump and crank pulleys. Correct Nascar Hemi headers with slip joint connectors at the rear. Headers are constructed of stainless steel and have been Jet Hot coated. Chrysler A-833 4-speed transmission. Trans has been rebuilt with new bearings, and syncros. Has steel shift forks for increased durability. 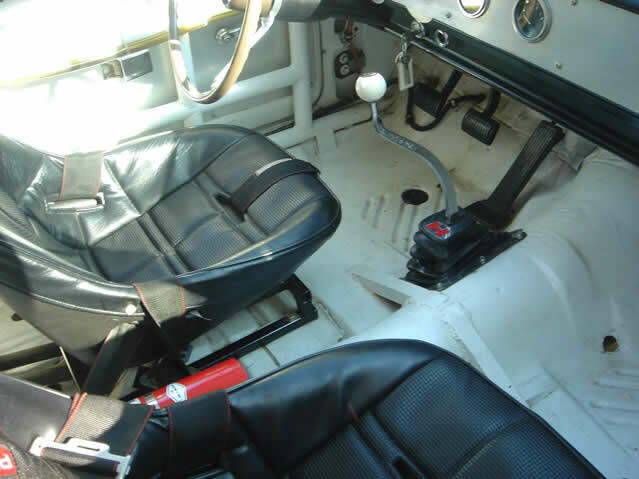 Hurst Competition Plus shifter. 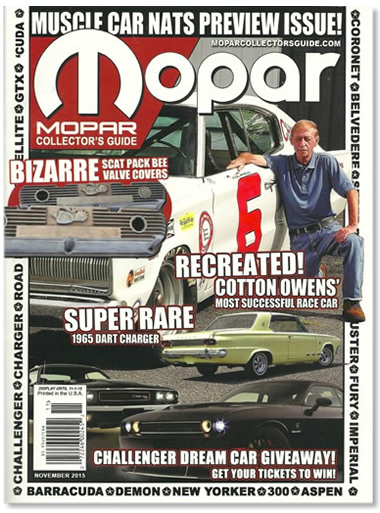 Car was constructed with a rust free 1966 Dodge Charger body, all body panels are original and rust free. 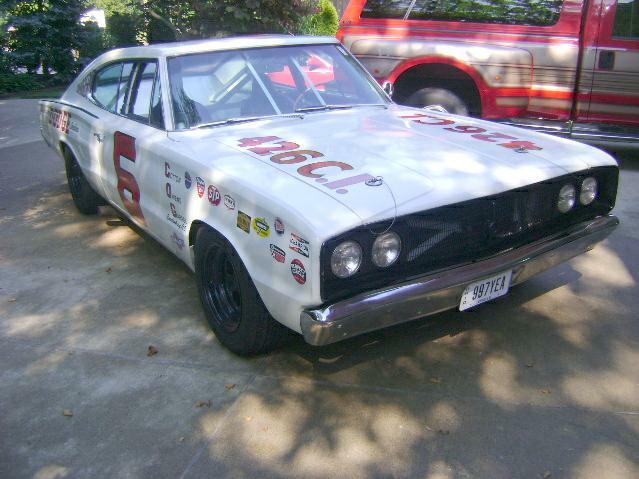 Roll Cage was built by Billy Biscoe of Denton, NC who has previously worked for Richard Petty and Cale Yarburough. 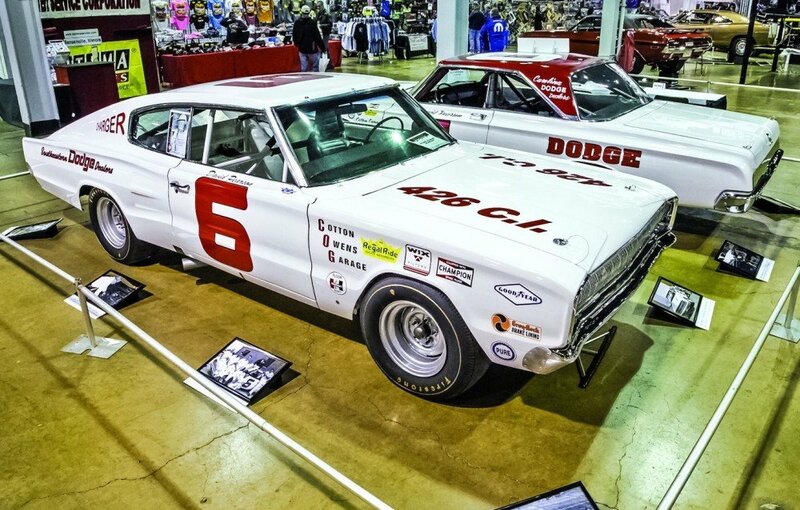 It is time period correct for 1966 Nascar Grand National Racing Specifications. Cage is constructed from .095 wall 1.25 diameter DOM Steel Tubing. Wilwood Period Correct Four Piston Aluminum Front Calipers with NASCAR Rotors. Wilwood Current Four Piston Aluminum Rear Calipers with Cast Rotors and aluminum hats. Master Cylinder is a Chrysler Dual Reservoir unit. All lines are steel with flared ends and AN fittings at the calipers. Flexible caliper lines are Aeroquip braided stainless steel over nylon tubing, fittings are all Aeroquip. ATL 22gal Fuel Cell contained in steel container. Airtex NASCAR engine mounted Mechanical fuel pump. 5/16” steel Fuel line. Nascar style Fuel Filler Cap, located on the driver’s side. Electronic Stewart Warner Fuel Gauge mounted in dash, mechanical fuel gauge located on top of fuel cell. Chrysler 8 3/4" Posi rear end assembly with 3.23 gears. Moser Engineering High strength Alloy Axles. Extended length 5/8” diameter wheel studs on a 5” bolt circle. Monroe Max Air Shocks installed for rear height adjustability. Upper and Lower Control Arms are Fabricated Nascar pieces obtained from Richard Petty time period correct. Uppers are adjustable tubular style. Lowers are a modification on C-Body Control Arms where they have been structurally reinforced for Nascar use. Spindles and Hubs are Heavy Duty time period correct Nascar pieces, studs are extra length, 5/8” diameter on a 5” bolt circle. Clement Industries Original Nascar wheels with reinforced center sections. Bolt pattern is the correct 5 on 5 with 5/8” studs on all 4 wheels. Gauges are all Stewart Warner Competition Series. Tachometer is cable driven. 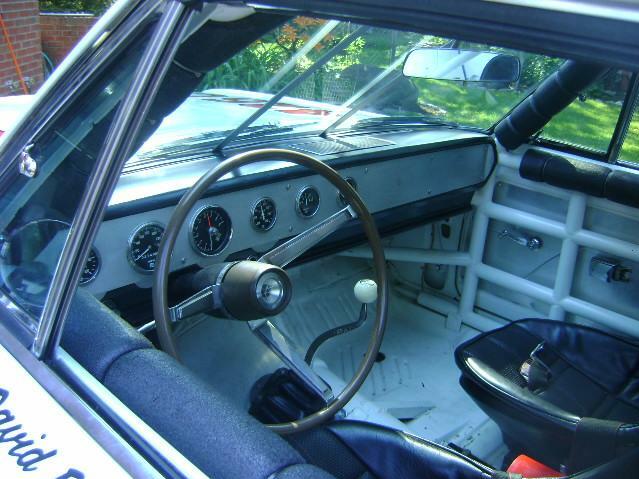 Gauges are mounted in a fabricated aluminum instrument panel correct for the time period. Gauges include: Tachometer, Speedometer, Ammeter, Oil Temperature, Water Temperature, Fuel Quantity. 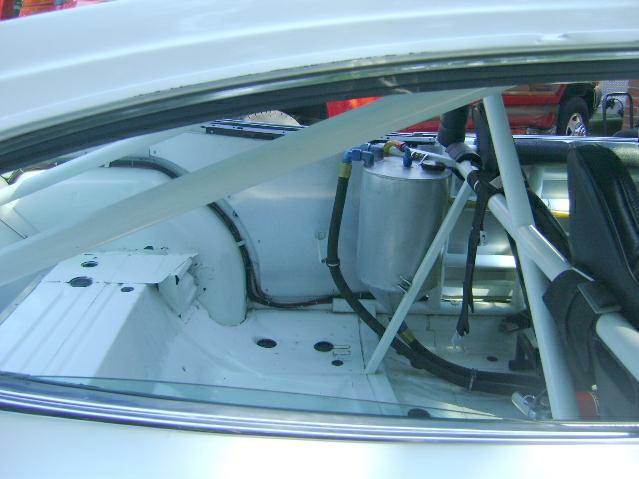 Electrical system has the battery mounted in the trunk on the passenger side. Car has all of the needed switches to make it Street Legal; Headlights, Turn Signals, Windshield Wipers, Parking Lights. An Absolutely Rust Free 1966 Dodge Charger body was used for the start of this project. It was completely disassembled and cleaned by pressure washing. 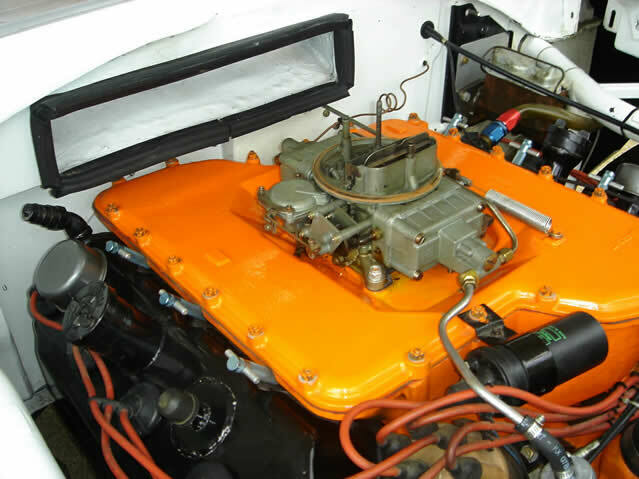 The undercarriage was refinished using a low gloss enamel chassis black. The fuel filler door and rear trunk emblem were removed and made flush with the body. The Body was painted inside and out using Acrylic Enamel single stage paint. The color is White. The interior is detailed using aluminum panels over the doors and rear of the interior. An aluminum panel was fabricated to close-out the rear fuel cell area. This panel is attached with Cleco fasteners and is removable for access to the trunk area. 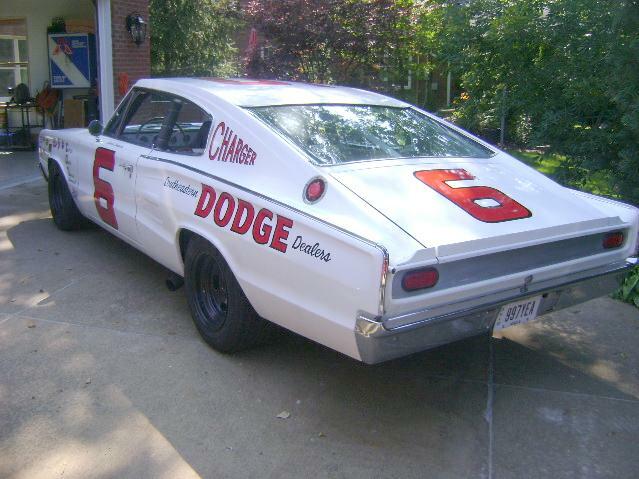 An authentic time period correct Nascar rear spoiler is attached to the rear of the trunk lid and quarter panel s. All of the Lettering on the car was hand painted using the correct colors and locations to match the original Pearson Nascar Charger. Original Nascar 426 Race Hemi Headers made of Stainless Steel with slip connectors at the rear are installed. 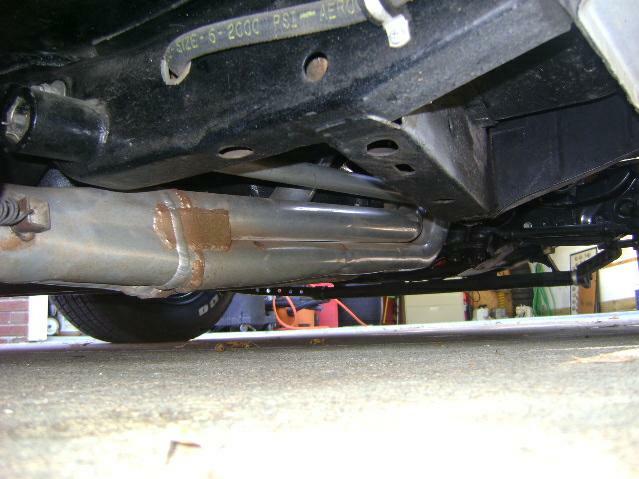 The balance of the exhaust system is all 3” diameter and consists of 2 Round straight through mufflers at the front with 2 oval Flowmaster mufflers at the rear. The system is connected to the headers with tension springs and is easily removable. The exhaust tips are oval in shape and exit at the correct location, just behind the doors. The exhaust system has the very notable HEMI sound to it. While it is not quiet by any means; it is not so loud as to draw attention to the car when being driven on the street.